Relieving tension and hyperactivity – You know what it’s like when you just need to go for a hard run or lift weights when you’re feeling stressed or restless. Dogs also can experience this. In fact, many behavior problems are linked to frustration as dogs are left lounging when their instincts are telling them they should be hunting deer in the wilderness. Cats can become destructive too if they don’t get enough activity. Cardiovascular health – Veterinarians recommend exercise for animals because the same risks to our hearts and lungs can affect animals. Heart disease, breathing problems, and hypertension can occur in inactive pets. Get them out there moving and their cardiovascular systems will stay healthy. Maintaining proper weight – Exercise uses energy in the form of calories. If this energy is not burned inactivity, it is stored as fat. A new study from Banfield Pet Hospital found that around a third of pets in the United States were either overweight or obese. The numbers had dramatically increased in the past 10 years. This tracks with growing obesity among humans in the country. If pets have inactive, overweight owners, they will likely have nobody to exercise them and will become overweight themselves. It’s fun! 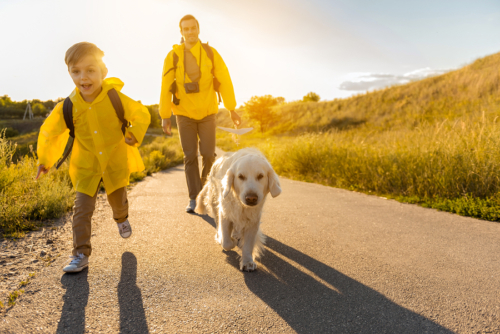 – Hiking in the woods, playing fetch at a lake or frisbee at a park, entertaining your cat with fake mice, all of these are great ways to get your pet some exercise. They’re also a great time. You can build your relationship with your pet in a fun way while getting them some necessary exercise. It doesn’t have to be a chore. You’ll get exercise too – Another added benefit of exercising your pet is that it gets you off the couch and moving too. Jogging alongside your dog means you will be getting your own heart rate up. Even a casual walk in the park is a good opportunity to get your blood flowing more than it would be sitting at home. Playing with a pet, no matter what you’re doing, involves moving and interacting, so both of you will benefit. The great thing about exercise is that it’s pretty simple. Just get out there and do something. Walk, run, play, swim and just have fun with your pet. No need to read any more about the benefits. Time to grab the leash and get to the park. Dogwood Veterinary Hospital can clear your pet before you start any exercise regime if you are concerned about their fitness. When in doubt, start slowly and increase gradually. We are here in Chapel Hill if you need any advice or want us to help manage your pet’s weight and health. Come by or call (919) 942-6330.